1Pc Tablecloth. Material: Satin. Colour: White. The actual item's colour maybe slightly different from the picture shown due to the lighting when the picture was shot and the monitors. 1Pc Tablecloth. Colour: White. Material: Satin. The actual item's colour maybe slightly different from the picture shown due to the lighting when the picture was shot and the monitors. Plain Round Satin Weave White Tablecloth. Fabric: 100% Polyester. Machine Washable at 40 degrees. Scalloped Edge Finish. 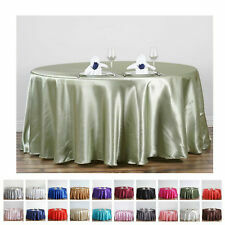 35 inch Round (89cm) Polyester tablecloth with jaquard leaf vine, 6 colours. 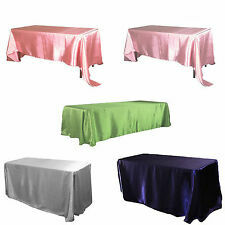 35 inch Round (89cm) Polyester tablecloth with jaquard geo metric, 7 colours. Colour: white. Material: poly satin. Material: Polyester spun. Can be machine washed and dried. 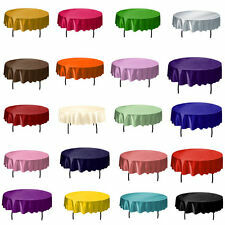 Plain Round Satin Weave Cream Tablecloth. Fabric: 100% Polyester. Scalloped Edge Finish. Detailed Photographs. 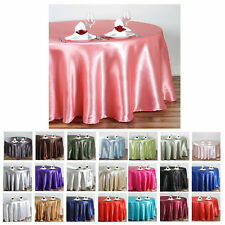 1Pc Tablecloth. Colour: White. Material: Satin. The actual item's colour maybe slightly different from the picture shown due to the lighting when the picture was shot and the monitors. Our goal is to make sure that you can find exactly what you are looking for and make it easy for you to place your orders. A QUALITY WEIGHT SATIN POLYESTER WHICH IS FULLY MACHINE WASHABLE AND NON-IRON, WILL LOOK GREAT AT CHRISTMAS. QUALITY ALL THROUGH. Plain Tablecloth Clean Sqaure/ Rectangular Table Cloth 145cm 57"
Fabulous Winter Branch Christmas Round Table cloth Gold & Cream 160CM (63")Diam. Gorgeous Winter Branch design tablecloth in gold/cream. Easy care polyester satin. 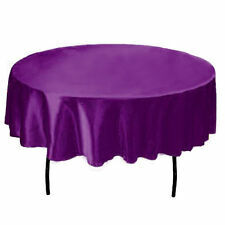 Here we have Beautiful Clean Satin Band Polycotton Round White Tablecloth. 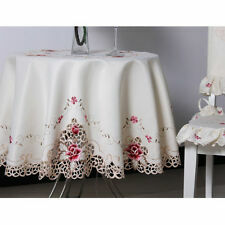 As well as this style, we have many other tablecloths for sale. 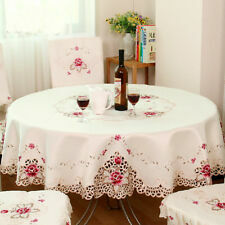 These table clothes are made from fabric made from a that consists of cotton and polyester fibre.